President Donald Trump's tax law was sold as a transformative overhaul that would unlock an ocean of money Corporate America could spend on job-creating investments. However, the promised investment boom has not materialized -- not yet anyway. 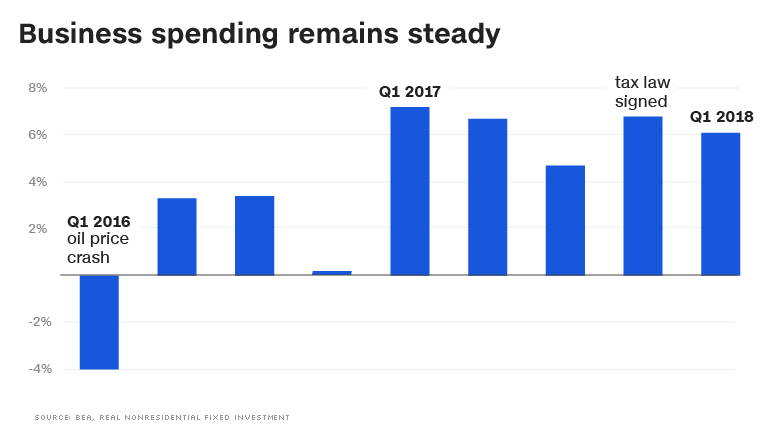 Business spending is humming along at healthy levels, but economists see little evidence that the tax cuts sparked an acceleration of investments in new equipment, factories or other projects. "There is nothing to suggest the tax law is lifting investment in any substantive way, at least so far," said Mark Zandi, chief economist at Moody's Analytics. "I'm not totally surprised. It's early days. It will take time for businesses to make decisions," said Zandi. That kind of growth is "remarkably unremarkable," according to Ed Yardeni, president of investment advisory Yardeni Research. Rather than the tax law, Yardeni argued in a client note the pick-up in business spending was driven by a rebound after the "rolling recession in commodities" from the past two years. Money is being poured back into oil projects now that prices have recovered from the recent crash. "At this point, it seems more related to a rebound in China, domestic energy and mining as opposed to tax cuts," said Jason Thomas, Carlyle's director of research and a former White House economic staffer. The tax law, Trump's signature legislative achievement, created massive savings for major companies by reducing the corporate tax law from 35% to 21%. The overhaul also gave companies a tax break on repatriated overseas profits. In an effort to boost investment, the legislation allows businesses to immediately write off the expense of capital spending. However, American factories don't appear to be enjoying a surge of new orders just yet. Orders for durable goods, excluding volatile defense and aircraft, are at the same level as October and remain well below the spike experienced in 2014. "Investment has been okay, nothing spectacular. If you didn't know there had been a tax bill passed, you wouldn't say, 'Aha, something is going on,'" said Alan Auerbach, director of Berkeley's Robert D. Burch Center for Tax Policy and Public Finance. Almost immediately, Corporate America returned a big chunk of its windfall to shareholders in the form of fatter dividends and bigger share buybacks. Apple (AAPL) alone spent $22.8 billion on stock buybacks during the first three months of the year, more than any company in American history, according to S&P Dow Jones Indices. "Most of this, at least in the near term, is going to shareholders," said Zandi. All told, S&P 500 companies showered shareholders with $178 billion of stock buybacks during the first quarter, according to S&P's Howard Silverblatt. That exceeds the $159 billion that Silverblatt said S&P 500 companies devoted to capital spending. However, capital spending was up 21% from the same period of last year and hit a record high for the first quarter. Part of that was driven by a $2.5 billion spending spree by Google owner Alphabet (GOOGL). "Share buybacks are a very quick and easy decision for boardrooms," said Russell Price, senior economist at Ameriprise Financial. "Big-ticket projects take planning, engineering and sometimes architectural drawings." Related: Is this the last hurrah for stocks? It's possible that businesses are holding off on investing because of other headaches, including a lack of skilled workers, the trucker shortage and rising prices for raw materials. Talk of a trade war with China and Trump ripping up NAFTA can't help either. It's not like companies were strapped for cash prior to the tax law. Companies were already sitting on record amounts of cash and borrowing costs were extraordinarily low. "Money has been cheap," said Boockvar. Still, some economists believe the tax overhaul may in fact spark an investment boom -- it just hasn't happened yet. "The bulk of the benefit still lies ahead. The pace of investment spending should be quite strong as we move forward," said Price. Yardeni agrees, pointing to surveys of CEOs by the Business Roundtable that detail plans to ramp up spending. "More likely than not, greater business investment is ahead," Yardeni said. Zandi also thinks that business spending will accelerate. However, he's not sold on the argument the tax law has dramatically improved America's long-term economic outlook. "It's not a gamechanger," said Zandi.